Does VR Work for Energy Efficiency? EEIP is partner in the EU funded H2020 project ICP. ICP aims to better connect financial markets with energy efficiency sector in Europe to enable better access to finance for project developers and finally to more energy efficiency projects implemented. The idea behind is rather simple: reduce the uncertainty of project outcomes and make projects bankable. The approach is based on what financial markets call the "DNA" of business: Standards. ICP has developed certifiable and technology neutral project process standards and supports project developers (and investors) with training and project assistance in the implementation. And ICP is supported by a global network of industrial allies as well as an investor network ready to invest more than a billion EUR. Even though the arguments are convincing, reaching target groups with such a rather dry and technical subject is always more difficult than many expect. Constant overflow of information and daily business pressure are the enemies - making it hard to get project developers’ attention for 30min enough to explain the basics and benefits of the new approach. Once this has been achieved, ICP can convince many stakeholders to take the effort to participate in a training and to apply the ICP protocols - but many of you know how difficult it is to get 30 min attention for a new subject, especially if this is the first contact! We have used a Virtual Reality environment from a company called Hyperfair and designed it to our needs. The environment can be accessed via laptop (looks a little bit like a 3D game) but now also via mobile VR using a standard mobile up to full VR including hand controllers, the rather expensive option (still). And it can obviously be accessed from anywhere at the same time. 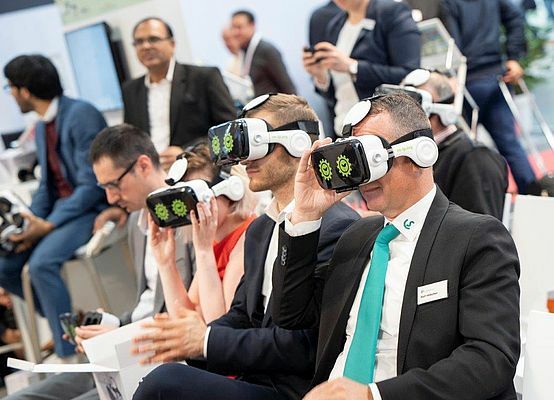 The idea was to leverage the Hannover Messe, biggest industrial fair globally, to run an "event in an event": A physical "event" where participants come together - to then use mobileVR headsets to jointly experience the ICP presentation in VR. This has also allowed others not having a mobile VR headset to follow the presentation on the "real screen" to which we streamed the VR event. In other words, we ran the event in VR, but people "outside" could see the presentation and the VR participants (or their avatars) from the outside. The results were astonishing. We were very convinced that it would turn out being a success, but results were even better than expected. With a primarily online based announcement marketing communication, we reached more than 100.000 - with this topic..., not covering visibility generated through 3rd parties talking about it and articles such as newsletters from the Hannover Messe itself. We had also more positive feedback and follow up discussions than we could manage. And more interest generated compared to what we got in many months of communication strategies.